Purchases: From the artist | Check your local music store! The last time I tried to blog about a Cloud Cult album, I just posted a bunch of videos and said it's near impossible for me to write about their music because it is such a personal experience. I don't want to let my poorly chosen words taint someone else's experience, or not really convey what I'm trying to say. I didn't even mention Lost Songs from the Lost Years, which I bought and listened to last May/June because I was going through a really painful time and that album was so important to me. I want to reiterate that idea, that my words can't convey my feelings for this music, even though this time I'm going to try to write a little more (mostly since I haven't blogged about music for awhile :P). I bought this album a month ago but that was right when end of term/exams/papers were happening so I've listened to and thought about it many times, I just haven't had time to blog. There's a great balance between the soft, moving, thoughtful songs and the more musically-intense tracks (like 'Thanks' or 'Song for the Dead' vs. '2x2x2' and 'Please Remain Calm'. There's stories ('Alien Christ', 'The Deaf Girl's Song') and there's songs so injected with emotion it makes my heart ache ('Your 8th Birthday' and 'Take Your Medicine'). And of course there are the songs that fall into all of those categories. 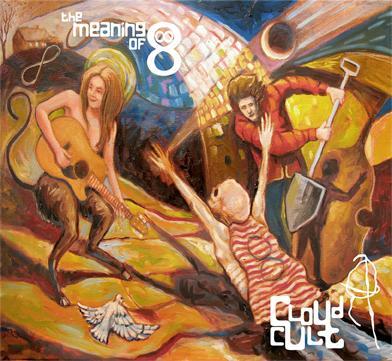 There is just so much I love about Cloud Cult and I think this album really shows the best of all those. The other Cloud Cult albums I have are all associated with a particular emotion/state of mind, which is a very good thing, but it's also great to have this album that 'feels all the things'. One of the things that appeals me to so much about this album are the uplifting 'love songs', if I may use that phrase here. Tracks like 'Pretty Voice' and 'Chemicals Collide', about reclaiming and holding onto lost love. I have so much respect and admiration for Craig and Connie, and what they went through, and how they've made it to where they are today. It's nice to hear such real, 'authentic' songs (this would be a good example of a sentence where my words totally failed me...). I was kind of surprised by the catchiness of 'The Girl Underground' - I adore all of Cloud Cult's song, for the music and the lyrics, but I've never really found one of their songs to be ultra-catchy for me in that the rhythm constantly plays on loop in my head and I want to jump and dance around whenever I hear it. That song has a good beat! Right, so there was my attempt at describing how much I like this album...I could say more but I think it would be better for you to stop reading and just listen to some Cloud Cult.